Therefore the eminent seers sing of me in the world by the name of Tara." Ven'rable One! I cannot describe Your infinite virtues." "Arya Tara who symbolizes the activity of all the Buddhas ..."
"Stunned by beauty, overwhelmed by grace, it was only through You that I experienced the fullness of giving..."
Terhune, Lea. Karmapa of Tibet: The Politics of Reincarnation. Wisdom Publications, 2004. The Seventeeth Karmapa's daily life is a quiet one. Gyuto Monastery is located off the main drag of Sidhabari, a village situated on the green, fertile agricultural land below the Dauladar Range. In winter the mountains behind the monastery are dusted with snow. The monastery is build on land that rises toward the mountains. The Karmapa stays on the upper floor of the pale yellow residential wing behind the main audience hall. Yellow is a color traditionally associated with Buddhist monks. He takes his exercise on the roof. His disciplined daily life is confined to about 1,200 square feet. He rises early to pray and eat breakfast before spending a few hours with his tutors. His first puja of the day is to Green Tara, the female bodhisattva who brings good fortune and fulfillment. There are moments during life when a startling but marvellous experience leaps into mind as though coming from another world. The magic that calls if forth--as though someone had accidentally whispered the 'open sesame' that rolls the stone back from the hidden treasure--is often so fleeting as to be forgotten in the joy of the experience. It may be a thin cadence of music: a skylark bursting into song, the splash of a wave, a flute played by moonlight. It may be a grand harmony of sound, peaceful or awe-inspiring: the murmurous voices of a summer's afternoon or the fateful shrieking and drumming of a mountain storm. It may be something seen: a lovely smile or the curve of an arm; a single gesture, form or hue of compelling beauty; a familiar scene transformed by an unusual quality of light; a majestic panorama of interweaving colours splashed across sea or sky; a cluster of rocks suggestive of enormous beings imbued with life. Or the spell may be wrought by a sudden exaltation springing directly from the mind and jerking it, so to speak, into an unknown dimension. This page provides information for western students interested in the Tibetan Goddess Arya Tara, a meditation diety who may, if She chooses, jerk the student's mind into an unknown dimension. Links to current publications and background materials may be helpful to those interested in meditative practice. 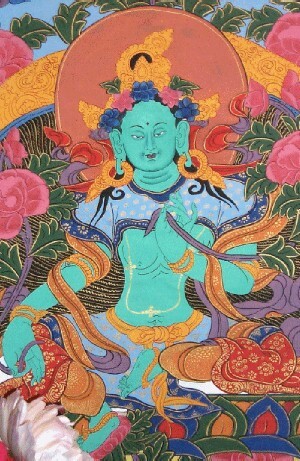 Tara is the most beloved of deities, particularly for the Tibetans. Legend has it that once, as person just like us, she has served countless Buddhas. And ages ago she took the Bodhisattva Vow, to work for the benefit of all beings until every one of us is enlightened. While this page is dedicated to her Tibetan form, as Mother Goddess she arises out of many times and places--Durga and Tara in India or Demeter, Artemis, and Isis in Rome who were later overshadowed by the Virgin Mary. Tara is quite well known to the West through Her Tibetan manifestations, but some are unaware of the important position She occupies in the Hindu tantrik pantheon. She is the second of the ten Mahavidyas. Erich Neumann, a former student of Carl Jung, discusses the highest form of the feminine archetype, the Goddess of Spiritual Transformation, and views Tara as the highest evolution of this universal aspect of consciousness. Radically defying the tradition of assuming only male rebirths after taking the Bodhisattva Vow, she made a second vow - to work for others forever in the form of a woman. At the turn of the second millennium, as the feminine archetype arises out of intense planetary need, Tara lives and works intimately in the world as a Bodhisattva. In contrast to most of the Buddhist Tutelary Dieties she is directly accessible to the uninitiated, a characteristic which contributes to her popularity. Her heart, devastated by the torture and killing of her disciples in Tibet, has followed the diaspora of Tibetan Lamas across the planet. As a result, she is very accessible to western students who practice her sadhana. Atisha - "... like a king, the crown ornament of Indian Buddhists, [he] was regarded as a second Buddha." The founder of what is now the dominant form of Tibetan Buddhism brought Tara to Tibet at the turn of the first millennium. Machig Labdron - "the Shining Light of Lab." 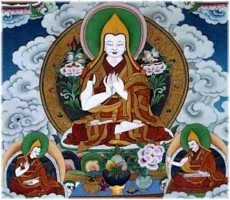 "Accordingly, all the disciples of Atisa and of the Conqueror Tsongkapa took the holy Tara as their highest deity, and prayed to her alone, especially the Omniscient Gedundrub (the first Dalai Lama) would do whatever he did only after he had prayed to the holy Tara, and thereby his active power to augment the aims of the teachings and of beings became as great as infinite space. Indeed, the majority of holy men in former times took the holy Tara as their highest deity..." Beyer, 1978, p. 14. Queen Wenchung, seventh-century queen of Tibet and an emanation of the Buddha Tara, who brought to Tibet from China the famous Jowo Rinpoche, the statue of Shakyamuni Buddha in the Jokhang Temple in Lhasa. Photo by Robin Bath, cover of Mandala, Jul/Aug 1997. Blofeld, John. The Tantric Mysticism of Tibet: A Practical Guide to the Theory, Purpose, and Techniques of Tantric Meditation. Arkana (Penguin Books), 1970. ISBN: 0-14-019336-7. Blofeld has many insightful comments about Tara, as he was assigned her as Yidam by his Tibetan guru. Nyanaponika, Hellmuth Hecker, Bodhi, Nyanaponika Thera. Great Disciples of the Buddha: The Lives, Their Works, Their Legacy. Wisdom Publications, 1997. Just as Jesus was surrounded by the 12 apostles, Buddha also had a retinue of followers. The remarkable spiritual achievements of these early disciples are thought to establish the relevance and power of the Buddha's teaching. In this inspiring book, 24 of the most distinguished disciples, including eight women, are brought to life in living portraits. Thurman, Robert A.F. Essential Tibetan Buddhism. Harper 1995. Campbell, June. Traveller in Space: In Search of Female Identity in Tibetan Buddhism. George Braziller, 1996. A more provocative view of Tibetan Buddhism from a feminist perspective. Combs, Allen. The Radiance of Being: Complexity, Chaos, and the Evolution of Consciousness. Paragon House, 1996. Lopez, Donald S. Prisoners of Shangri-LA: Tibetan Buddhism and the West. University of Chicago Press, 1998. Powers, John. Introduction to Tibetan Buddhism. Snow Lion Publications, 1995. A good general introduction to Tibetan history and religion. Thurman, Robert A. F. Inner Revolution : Life, Liberty, and the Pursuit of Real Happiness. Riverhead Books, 1998. Perhaps the best combination historical and personal overview of the Buddha's mission to planet earth by the first American to be ordained as a Tibetan Buddhist monk. Surya Das, Lama. Awakening the Buddha Within: Tibetan Wisdom for the Western World. Bantam Books, 1997. If you live in the Boston area, you should "support your local lama." Surya Das is a Jewish kid from Brooklyn who became an ordained Tibetan Lama and founded the Dzogchen Foundation. Dharmachari Purna. Tara: Her Origins and Development. Western Buddist Review, Volume 2. "Over my years of meditation on the goddess-Bodhisattva Tara, she has provided me with Refuge and, guiding star that she is, given me a direction by which to steer. I write this in the hope that others may also learn something of her friendly light." Landaw, Jonathan and Weber, Andy. 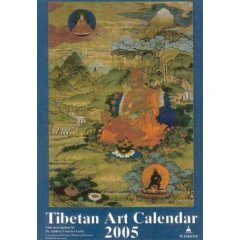 Images of Enlightenment: Tibetan Art in Practice. Snow Lion Publications, 1997. Willson, Martin. In Praise of Tara: Songs to the Saviouress, Revised Edition. Wisdom Publications, 1996. 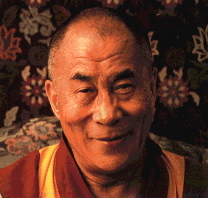 Yeshe, Lama Thubten. Becoming Compassion Buddha: Tantric Mahamudra for Everyday Life. Wisdom Publications, 2003. A complete meditation retreat from one of the pioneers of Buddhism in the West. Mou-Lam, Wong (Translator) and Price, A.F. The Diamond Sutra and the Sutra of Hui-Neng. Shambhala, 1990. This book from the Zen tradition is the best meditation manual I have found for work on eradicating the illusion of self. Good preparation for the study of Tsong Khapa's teachings. Modern science views the human body, mind, and persona as a dissipative system. This provides a clear and contemporary explanation of why things do not have inherent existence. See Capra, Fritjof. The Web of Life : A New Understanding of Living Systems. Anchor Books, 1997. The Diamond Sutra is the Buddha's eloquent instruction on this topic. Rinpoche, Kalu. Luminous Mind: The Way of the Buddha. Wisdom Publications, 1997. Thurman, Robert. The Central Philosophy of Tibet : A Study and Translation of Jey Tsong Khapa's 'Essence of True Eloquence'. Princeton University Press, 1991. Thurman is now the Jey Tsong Khapa Professor of Religious Studies at Columbia University and the leading exponent of the work of Tibet's greatest philosopher. Yeshe, Lama Thubten. The Bliss of Inner Fire : Heart Practice of the Six Yogas of Naropa. Wisdom Publications, 1998. If you don't have time for anything else, just do this! Baker, Ian A. and Shrestha, Romio. The Tibetan Art of Healing. Chronicle Books, 1997.